Today, I'm expanding BackDeckDiaries.com a bit to involve a little more variety than just cool photos of my favorite beverages. The one drawback to my drink photos is that I'm not able to enjoy them with you. So with that I'm introducing some content that I can pass along to you with the hope that we can discuss and share in what we learn together. So I give you my first Book Review segment and I assure you, this is not one to be missed. Every once-in-a-while you run across a book that changes your life, provides you focus or gives you that something you needed to bring it all together. I found it in "Fiercely Loyal" by Dov Baron. The subtitle "How High Performing Companies Develop and Retain Top Talent" states the overall purpose but this book holds more gems than I could've possibly imagined. It's about passion, loyalty, inspiring others, authenticity and growing talented leaders who care about their people. And it does this by starting the leadership journey with you first....the leader most in need of change. I recently had the opportunity to talk with Dov about his business and the topic of authenticity. I can tell you without hesitation, this is a man who's been on a mission, for many years, to educate leaders on how to give a damn about their people and their organization. The old models of leadership simply do not work. He went on to explain to me how today's millennial generation need leaders who are far more authentic if you're going to gain their loyalty. He even inspired me to write about authenticity in a leadership blog. You can view it here on GeneralLeadership.com. It's entitled Authenticity is the Secret Sauce. In his book, Dov provides a great explanation with examples and reasons why the old model of autocratic-style, top of the pyramid leadership doesn't work in today's world. The psychology and motive of today's worker is not driven to work 40 years for the same company without purpose and an understanding of self-worth to the orgnization. They want more and demand it from their leadership. And when it's not authentic, when there's no purpose, they will leave and find leaders who are providing their organizations with these traits and culture. Dov coins a term which I truly can relate to....he wants leaders to become Full Monty Leaders. Now, no one is stripping naked and running around crazy. What Full Monty Leadership means is being vulnerable, open, honest and developing the deep human connections that subordinates want in today's working world. It is through this style of leadership that true relationships are developed and organizational loyalty is created and sustained. According to his book, it's about getting "down in the trenches and getting to know our people. We need to understand what matters to them." Dov expands upon this point by saying this is more than an open-door management style. It's about seeing the humanity of people and coming from a place of genuine caring. This is the magic of Dov's message in retaining talent. This book will provide you the means to really look inside yourself and study whether your leadership is working or needs some tweaking. It'll challenge you and certainly may scare some in what Dov asks of you. He'll demand you open the hood, get dirty and see what's been going on inside of you and your leadership style. Go with it and see what comes about. But he'll also provide you a means to grow not only yourself but your organization and your workforce. It's straight-forward, easy to read and something you'll want to pass out to your organizations senior and junior leaders. Especially those who supervise others. I promise you, this is a style of leadership that works well in today's demanding world and it will fulfill not only the leader who displays authenticity but also those who want to become Fiercely Loyal. If you picked up a copy of 'Fiercely Loyal' please leave me a commend below and tell me your thoughts. I've read it twice and it's time to pass it along to someone I care about. 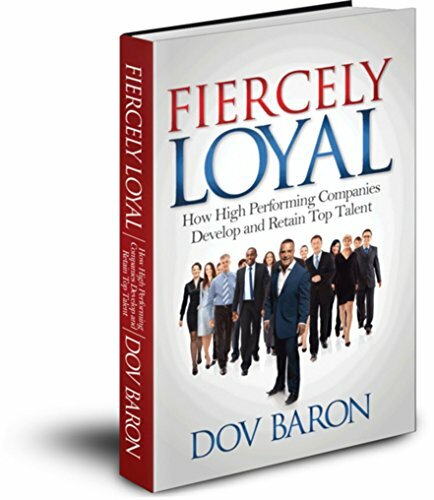 Get to know more about Dov Baron at FullMontyLeadership.com and purchase his book by going to FiercelyLoyalBook.com. Don't forget to check out his many and world-renowned Podcasts on iTunes and Podomatic. Dov Baron is a best-selling author and keynote speaker on the international circuit and one of the Top 100 Leadership Speakers for your Next Conference by Inc. Magazine.